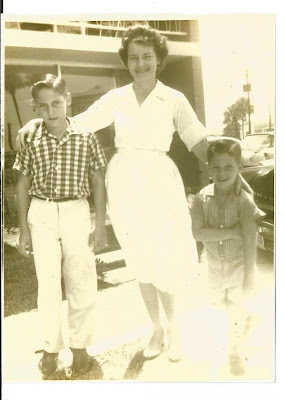 Here she is with her two sons, celebrating her 95th birthday. Here is the original post that I wrote for her 90th birthday, and I wanted to share it with you again as a tribute to this precious woman. What can I say about my Mother –in-law, Vivian Ruth Martin Steiner? She likes to tell the story about when I first became her daughter in law and I said to her that I wasn't sure what I should call her. I called my own mother, “Mom”. So she suggested that I just call her “Mother”. That worked for me. Then a few years later we started to call her “Nanny Steiner” (not to be confused with her mother, “Nanny Martin”)…when she became a Grandmother to her first Grandson, our first son, Benton. 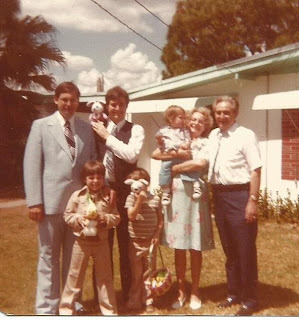 Then along came Matthew, and then a few years later, Scotty…and then many years later her first Great-Grandson, Noah…and then she was blessed with two more grandchildren from her son Billy and his wife Peggy; Nicholaus and Shannon. So now we all just call her “Nanny” to keep it simple. was awestruck by how pretty she was…and my first impression was that she looked like a very wealthy and sophisticated lady! Her beautiful blond hair was styled in a modern French twist, and she was wearing a stylish light tan rain coat. When she smiled at me I knew immediately where John got his wonderful smile from. I thought to myself that she reminded me a lot of Jackie Kennedy when she smiled, only she had blond hair instead of brown! Needless to say, she made quite an impression on me. Oh, and her friendly, down to earth way made me feel very much at ease right away. I was only too happy to become her first daughter in law several months later. Me with my sweet mother in law and her baby doll "Pearl"
having a fun time together. As I got to know “Mother” better, I began to realize that she was a humble but exceedingly generous woman, who loved her family more than anything. I soon learned that she and my father in law were the kind of people who would literally give you the last shirt off their backs if they thought you needed it. There was not a selfish bone in their bodies. I was to see that truth in action over and over again throughout our years together, especially once the grandchildren came along. As a young mother, I was pretty dogmatic about doing things “my way”, and I wasn’t always receptive to a lot of “advice” and what I thought interference from anyone else, including my own parents. So when my in-laws often showed up on our doorstep on Sunday afternoons with bags full of groceries and special things for the grandchildren, I tended to be a little frustrated. But God was teaching me about love and family relationships…and about the ways He chose to provide for us. He knew what we needed, and He often provided through the loving generosity of my mother in law and father in law. They were not wealthy people, but what they had they gave joyfully. It gave them so much pleasure to spend that time with us and to feel like they were contributing to our welfare; and I began to understand that I needed to learn humility and to accept the gifts with grace and thankfulness. We have shared so many experiences throughout the years…she has been there throughout our many moves…always ready to lend a hand in packing, unpacking, helping with the kids, the cooking, the dishes, the laundry, whatever I needed. She has been with us through the good times and the difficult times…don’t know what I would’ve done back when our son Matthew was having brain surgery if she had not come up to spend that time with us. She has been our sons’ greatest cheerleader and advocate when they played sports, graduated from school/college, and a constant support and voice of wisdom when they’ve gone through some difficult times as well. My mother in law is full of funny stories and laughter…and still has that beautiful smile. As I look back over the almost 44 years of being a part of the Steiner family, I can say with all honesty that I have been marvelously blessed to have been the daughter in law of Vivian Steiner. She has become more than just “a mother in law”, she is my “mother –in –love”, and I am honored to be her “daughter –in-love”. This picture below was taken in February, 2014, the last time we were all together with our son Matthew, who passed away from cancer in May, 2014. Update: Five years later I am still so thankful to have been a member of this family for almost 49 years...and I thank the Lord for giving me such a wonderful mother-in-law. When the Lord comes to take her home to heaven, she will truly be missed. What a blessing it is to live 90 years and I'm sure she is a blessing to each member of her family. She sounds like a very loveable lady, Pamela, you did a great post about her. Thank you Sylvia. I have been blessed to have had two wonderful "mothers", my own, and my husband's. God knew I needed a lot of "mothering"! What a blessing to be thought of like this. What a blessing she is! Thank you, Sandi. Yes, I do count myself to be a blessed and fortunate woman in so many ways...I couldn't have chosen a better mother in law if I had been given that privilege. I'm glad that God knew exactly what and who I needed. What a wonderful, loving tribute to your mother-in-law! I, too, was blessed with an extraordinary woman for a mother-in-law. When I married her youngest son she said I fit right into the family and pronounced me her daughter...daughter #6, as she had 7 children of her own. 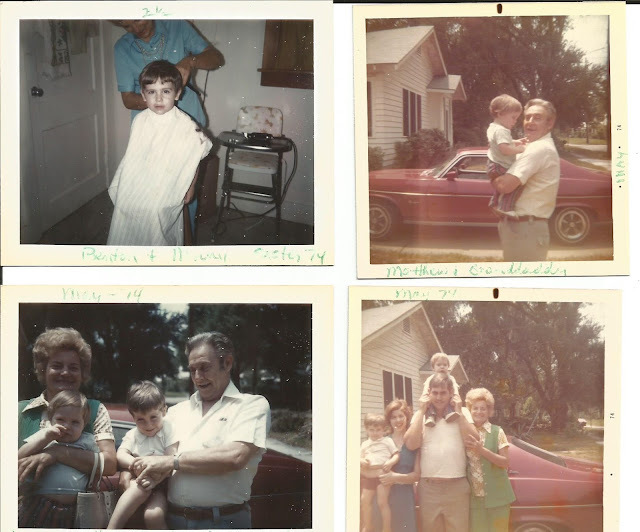 We moved to Florida after we married, 1000 miles away from my family, and I was so young, barely 20, that I really drew close to my mother-in-law and drew from her experience and strength. She has been gone since 2000 and I still miss her every day...and thank her for showing me what living out God's love really looks like. You have been blessed to have such a wonderful mother-in-love. Peace and Blessings. A beautiful tribute to your precious mother-in-law. Happy Birthday to her. Prayers for her as she is getting ready to go home. This is a wonderful post. I enjoyed reading it. May all go gently for your mother-in-law. Sermon Notes: "Off We Go"
Is It Really Friday Foto Friends Already?